The recent production by The Victory Players captured its exuberance to perfection. Wilde would have been proud. I have to assume, in writing this critique, that readers will know the complicated story. 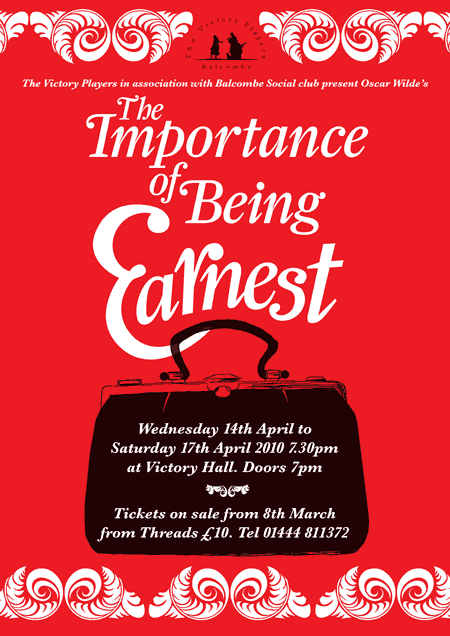 Simply put, it involves two friends, Algernon Moncrieff and John Worthing, who both turn out to be brothers; two ladies, Gwendolen Fairfax and Cecily Cardew, who get hopelessly confused, but end up by marrying them; an immensely powerful Lady Bracknell, who rules their lives; and Miss Prism, a governess who finally helps to resolve the problem of John’s parentage (she discovered him in a handbag at Victoria station); she is also sweet on the local clergyman, Dr Chasuble. 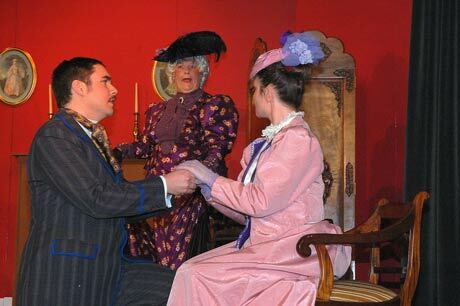 The whole play revolves around which of the two men is actually named Earnest, a name both ladies adore. The actors in this performance were all equally excellent Algenon (Rhys Whiteside) was suitably superior and snobbish but likeable. John - who actually was Earnest (Greg Field) was more obviously experienced in life’s little troubles, but more responsible. Gwendolen (Helen Savage-Butcher) was a stately, rather proud, lady in pink who found herself at odds with Cecily (Hannah Tullett) a beautiful, flirtatious teenager. They had wonderful confused and sarcastic rows over the man they each thought the other loved, only to be resolved when they realised they were enamoured of the wrong men. The relationship between them and between the two men was skilfully acted. Perhaps my favourite was Lady Bracknell (Shirley Michell) who was magnificent. She rivalled the stage and film performances of Dame Edith Evans. Her explosive entrances and outbursts dominated the stage, but she also had an acute understanding of other’s emotions. Miss Prism (Nicola Preston Bell) was suitably prim and proper but with a lurking attraction towards the unctuous Dr Chasuble (Douglas Wragg) an always dependable actor who captures the character of whatever part he is playing. But let us not forget the Valet (Rodney Saunders) a servile Jeeves, and the Butler (John Bunn) who gave a wicked impersonation of Julie Walters in her TV show. Excellent. Special congratulations to director Ronnie Whitehead in his first encounter with The Victory Players, he should be invited back. Also well done to the rest of the production team listed in the programme. By a strange coincidence, Oscar Wilde, when a student, became engaged to a Dublin girl called Florence Balcombe. She later married Brain Stoker of ‘Dracula’ fame. Click HERE to download a PDF of the programme (1.8 MB. To save, right-click and select "save target as").